Parade Flag Holders and Mounts! FH-PF1: Display up to three full size flags easily, prominently, safely and with a very custom show look. 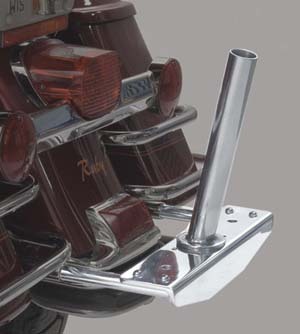 Install our THR style trailer hitch or model specific receiver bracket(s) sold separately, to your trailer hitch or saddlebag rails. 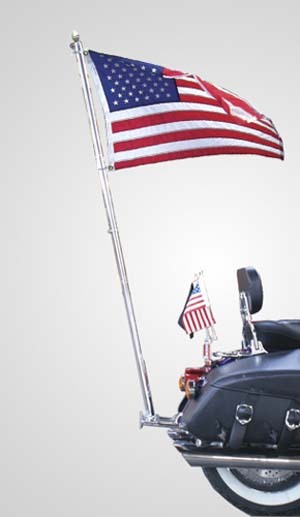 The flag holder bar with flag socket (one included with FH-PF1parade flag holder) can then be installed or removed from the bracket(s) in seconds by removing two safety pins. The trailer hitch mounted bracket will not interfere with your trailers coupler and does not need to be removed when towing. One or two more additional flag sockets can be added can be added (FH- PF92, sold separately) to accommodate up to three flags. 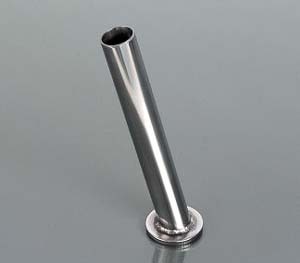 The socket(s) accommodate up to 1 1/4” poles, and are machined at a 15 degree angle to their bases. They can be rotated to display your flags, as desired. 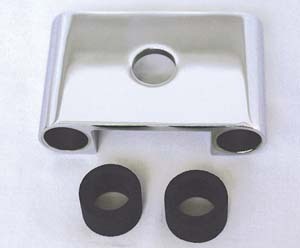 The holder is machined from aircraft quality aluminum, and the socket from steel, then both are polished to a flawless finish and triple chrome-plated. NOTE: One of the following model specific mounting and hardware sets listed below must be ordered separately to make a complete flag holder assembly. 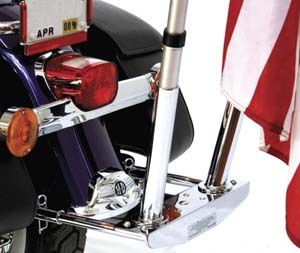 FH-HWK10 - for any motorcycle with an existing THR style trailer hitch. 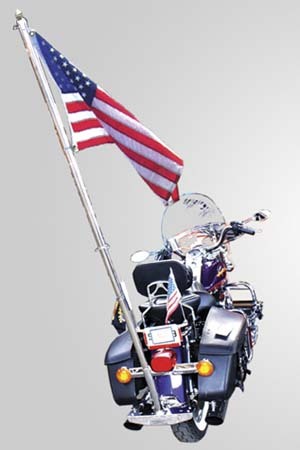 FH-HW15 - For all (2008 and earlier) Harley-Davidson FL & FLH models, FH-HWK20 - For all (2009 & newer) Harley-Davidson FL & FLH models. NOTE: The use of the following items, Part# GL18010, Part# GL18008, Part# QDLC-1/9 , and Part# HF-PF1 on any un-sprung trailer hitch will void the OEM warranty. These products were not designed to handle the excessive vibration and impacts from un-sprung trailer hitches, and the products may be damaged when used on those applications. 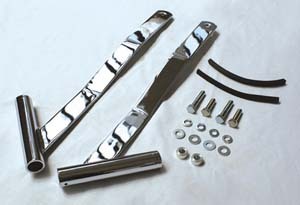 FH-HWK20: Kit contains the chromed receiver brackets & hardware required for mounting Parade Flag Holder (or our QDLC Cooler Rack) on 2009 to 2013 later Harley® FLH or FLT models. FH-HWK24: Similar to above for model years 2014 and later. 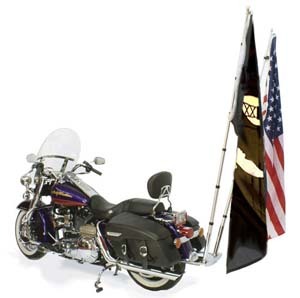 FH-HWK15: Kit contains the chromed receiver brackets and all hardware required for mounting the Parade Flag Holder (or our QDLC Cooler Rack) on Harley-Davidson® FLH or FLT models. Kit attaches directly to the your motorcycle’s frame, and includes complete photo-detailed instructions for easy installation. Fits 1990 to 2008. 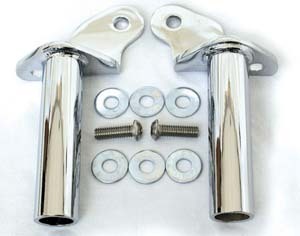 FH-HWK10: Chrome receiver bracket bolts onto any trailer hitch and remains in place. 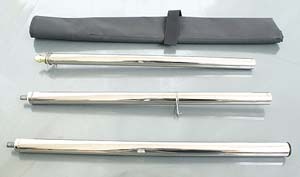 The rack or flag holder can be attached or be removed in seconds using the locking pins. 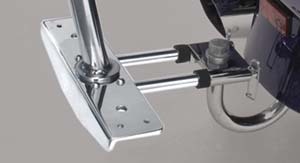 This additional bracket (racks come with one) can be used to mount on the front of your trailer or another bike so you can use your rack everywhere. 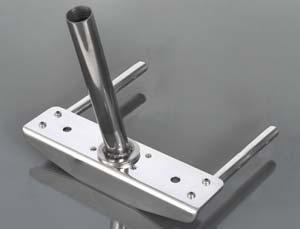 FH-92: Order additional flag holder sockets to display two or three flags on holder PF1000. Sold individually.